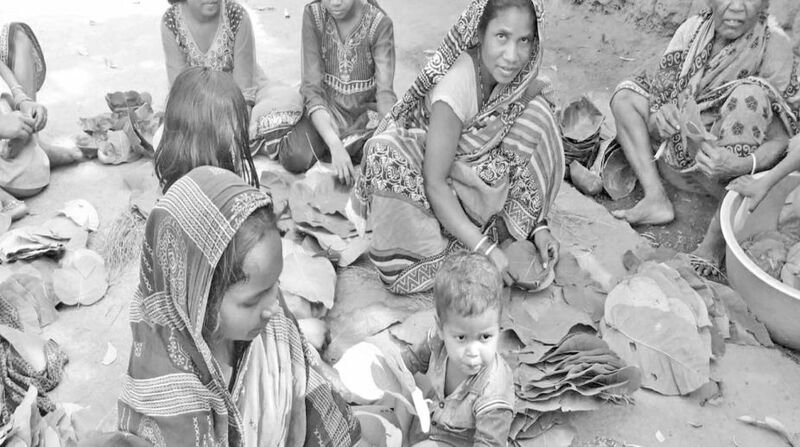 Tribals stitching plates and other items of Sal leaves lament the exploitation by middlemen in the absence of a government policy to market their produce. Middlemen purchase khali plates and cups made of sal leaves at a low price and market it to earn huge profit while the tribals , particularly women, struggle to sustain their families from such income. According to reports more than 10,000 tribal families are engaged in collection of sal leaves from forests in areas like Kankadahada, Parjang, some parts of Hindol and other parts of the district. They are engaged for over six months a year in collection of sal leaves and making “khali” and “chaupati”. Plucker, Namita Padhan, a tribal woman of Bhalumunda village near Kamakshyanagar, said she spends six hours every day collecting sal leaves and making plates. Eight sal leaves are needed to make one plate and 80 such plates make a bundle which sells at Rs 10 to 12 per bundle. We are able to make two bundles a day and earn Rs 24 only. una Pradhan echoed the same and pointed out at the risks that they take while collecting sal leaves from the forests. Though it is a minor forest produce, vendors should pay royalty but here middlemen neither pay royalty nor legally collect the leaves. They only sell the plate commercially making a huge profit. The government need to fix price of sal leaves and monitor strictly as price is fixed for kendu leaf, tribals suggest. These middlemen sell a bundle of khali with Rs 40 to 50. Tribals leader Akshya Pany told district administration need to take steps for interests of tribals . DFO Rinku Kumari said there is no committee for price fixation of sal leaves at district level. There should be systematic arrangement for sale of leaves. She said tribals can come with complaints against any exploitation by middlemen.